In the process of sorting through things (I’m always trying to get rid of things I don’t need to keep anymore, sort of a reverse pack rat) I came across some CDs of photos from 2000, when Tawn and I first met. 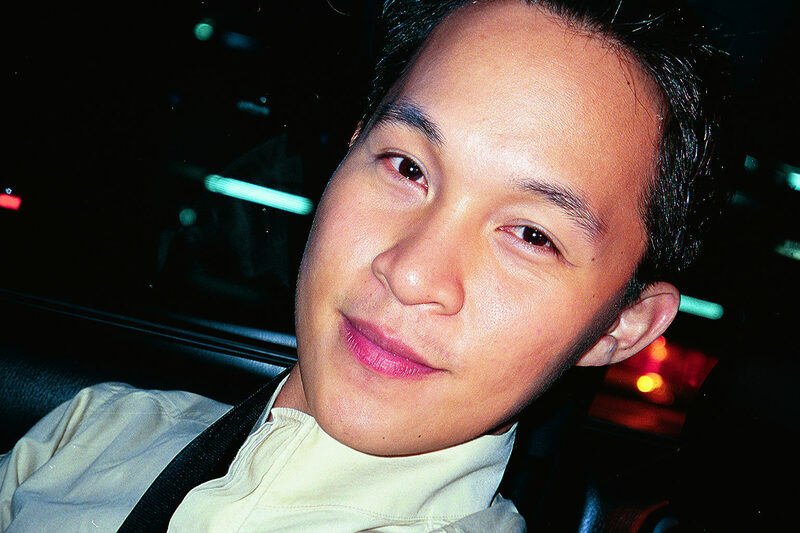 Dating all the way back to the 4th or 5th of January 2000, here’s the first picture I ever took of Tawn. Cute, huh? What a baby face! 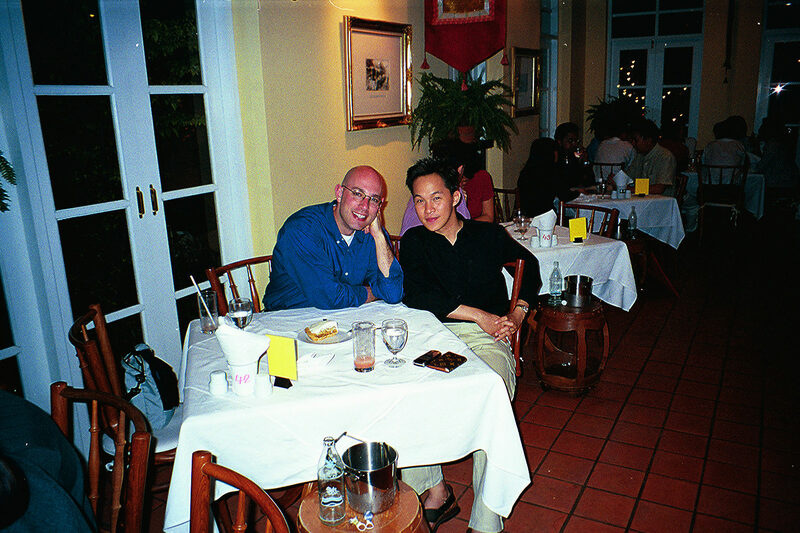 Here’s the photo of one of our first dinners together, taken at the now-defunct Anna’s Cafe on Soi Saladaeng. Yes, I had glasses back in those days. But no hair. It wasn’t until the middle of 2000 that I had lasik surgery. 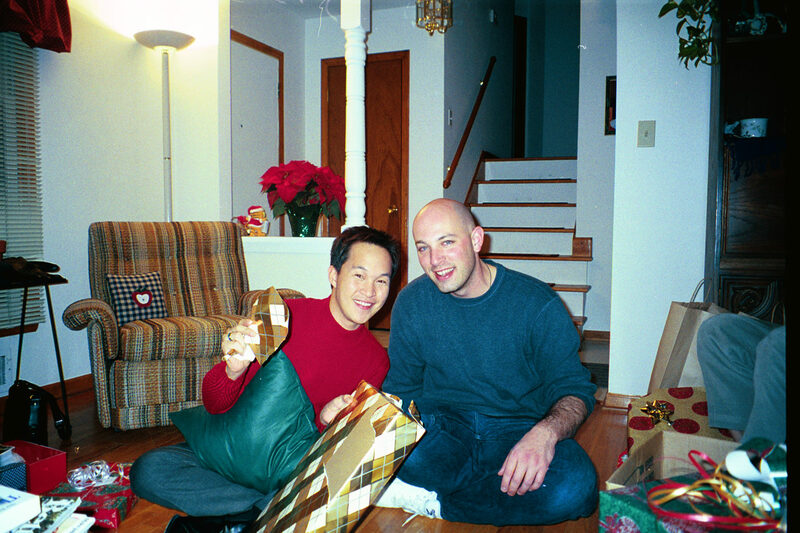 Tawn moved to the United States a few days before Christmas 2000 and we flew back to Kansas City to join my family for the holidays. Even back then, Tawn was warmly welcomed to the family. Here we are at my brother-in-law and sister’s old house, opening Christmas presents. Looking back at these pictures, I don’t think we’ve changed all that much. If you look at us up close, we have a few more wrinkles and a few more grey hairs, and I’ve gained a few kilograms since then, but not all that different. Speaking of changing looks, Tawn just had his hair cut quite short on the sides. I’m always urging him to get the sides shaved because I like the way it looks on him. He’s always very hesitant, feeling that it makes his face look too narrow. I think it accentuates his face. Here’s the picture of the new haircut. You’re welcome to share your thoughts about it. 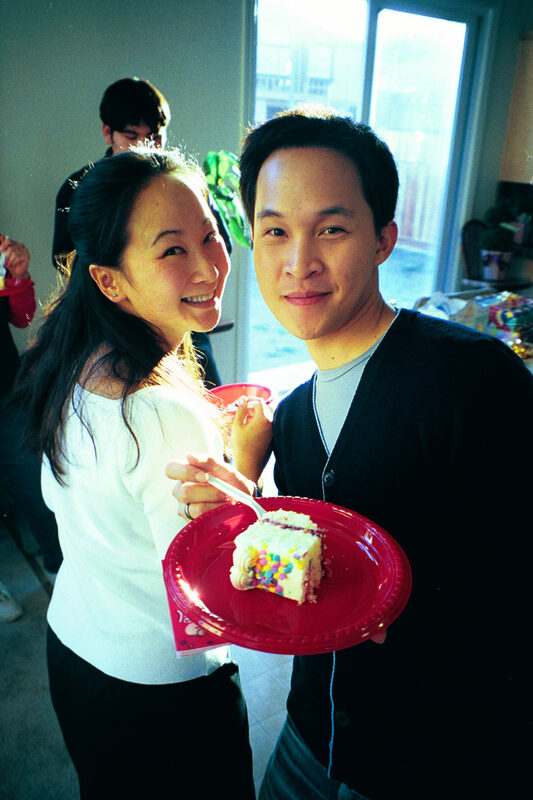 One final one, from March 2001, shows Tawn and my good friend and former roommate Anita at a birthday party held and Brad and Donna’s former house in Sunnyvale. Nice back-lighting! Looking more recently, almost exactly two years ago, here we are at Bua and Pom’s engagement party. Bua very thoughtfully made CDs for all her guests, containing copies of the professional photos featuring the guests and, of course, the photos of the bride and groom and wedding party. It is nice because the photos you always take yourself never turn out so nicely. I hadn’t seen these before – they were hidden away on a CD that Tawn tossed into the box of computer things. Tawn and me with his school friend Pim and her adorable daughter Tara. Tara, who is now going on four years old, always asks after me whenever Tawn goes over for a visit. She keeps asking why I don’t have any hair. 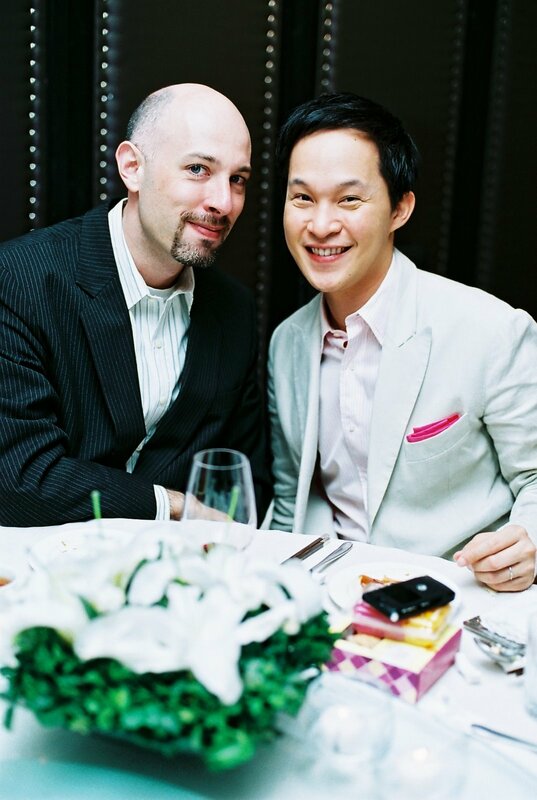 Finally, here’s a picture of the two of us at the engagement party. Some of the best pictures of us have been taken at weddings. It helps to have a festive atmosphere and a professional photographer. And a glass or two of wine. This entry was posted in Personal and tagged Relationships by christao408. Bookmark the permalink. So are we in the relationship show – season 7 now? Isn’t it fun to reminisce? I just love flipping through old photos… and you’ve got some great ones. You’re right–the wedding pictures are quite good. You and Tawn sure do make a cute couple. Chris, you are so romantic! Those are wonderful pictures and great memories. When we met in Bangkok, I could tell there was a lot of great chemistry between you two. As I said, you two are nice, handsome, and happy couple. The care, the love, the communication (verbal, and silent) really showed. Wish more straight and gay couples would learn from you both. Hey, were there ever any wedding pictures? baby pictures? Thank you for sharing those memorable pics of you both. Long way to go for your fantastic relationship. I have to agree with Tawn…more hair on the side of his head. We are thrilled that Tawn is a member of our family and that you both are enjoying the joys and challenges of building a life together. @euphorie – Thanks for the nice compliment. How are things going? I feel like I’m not reading a whole lot from you these days. @whonose – We will start season 10 in January. Here is our “how we met” story, which is pretty interesting. @stevew918 – @reallifedemo – @blue_beau – @jojobaDESIGNS – Aw… thanks for the nice words. You’re making me blush. Wow, you both look so young in the first couple pictures! And I really like Tawn’s new haircut! You guys are role models for a lot of folks (gay and straight). I absolutely adore that second picture! It is really beautiful. I think Tawn is the most beautiful person I have seen in a long time. I love his smile and the way his eyes smile is really charming. You both are very fortunate to find each other and have such a beautiful life together. Look older you say? a few wrinkles? Where??? Puhleez Chris, you are all of one year older than my daughter Saadia. Me thinks you want to look older than you are. muah. Thanks for sharing the pictures. Although I am getting ready to race off to see my partner in Germany, I had to take a second to share with everyone how lovely it was to see these photos. I remember the very first reports about Tawn, back at a time when we did not have instantaneous photo opportunities. It is so nice to be able to look back over your whole relationship and appreciate all that you have seen and done together, and how you have changed. Good for you. You both look wonderful and I do not see any extra weight at all. You are a most excellent host. I would be doing exactly what Bruce is doing, enjoying your hospitality and getting in as much Chris and Tawn time as possible! Have a good few weeks and have lots of fun with your visitors. You two are the ‘perfect’ couple while setting a good example where others look up to…whew…that’s a pretty hefty statement! Anyways, it was nice meeting you two during my trips to BKK and here in LA as well!! Very cute photos!! @Dezinerdreams – Thanks; glad you like it. @ElusiveWords – @curry69curry – Matt and Gary, thanks for the kind words but please don’t put us on too high a pedestal. Makes it too easy to fall! @kenpcho – Very good catch. Actually, I didn’t even notice it until you wrote it but, yes, I was clean-shaven when Tawn and I first met. I had worn a goatee before and even a beard for a while. Once I started growing a goatee, Tawn liked it. One day I shaved it off for a change and he was really upset, taking it as a sign that I didn’t love him anymore. Every since, I have kept it, fearful of making a mistake while shaving and lopping part of it off! @albertmoore – Have a good trip, Albert. Say hi to G for us and thank you for all the kind words. We would love to have you stay with us! you two are super photogenic! that guest room looks really cozy and inviting. your guest is going to love your awesome cooking. @christao408 – Hehe. Aw…Tawn’s cute for thinking that. :o) And that’s true! I would scared about accidently nicking a part of that goatee off! Luckily, I just foam my face and start mowing that facial lawn nice and clean. :o) No obstacles or hedges to landscape. Hehe. @stevew918 – Thank you Steve. @blue_beau – Thank you for the comment, I enjoy reading your blog too. @jojobaDESIGNS – Thank you for the compliment. @jandsschultz – Thank you Mom and Dad, I feel so good to be a part of the family. @ElusiveWords – very nice of you to say that, thank you. 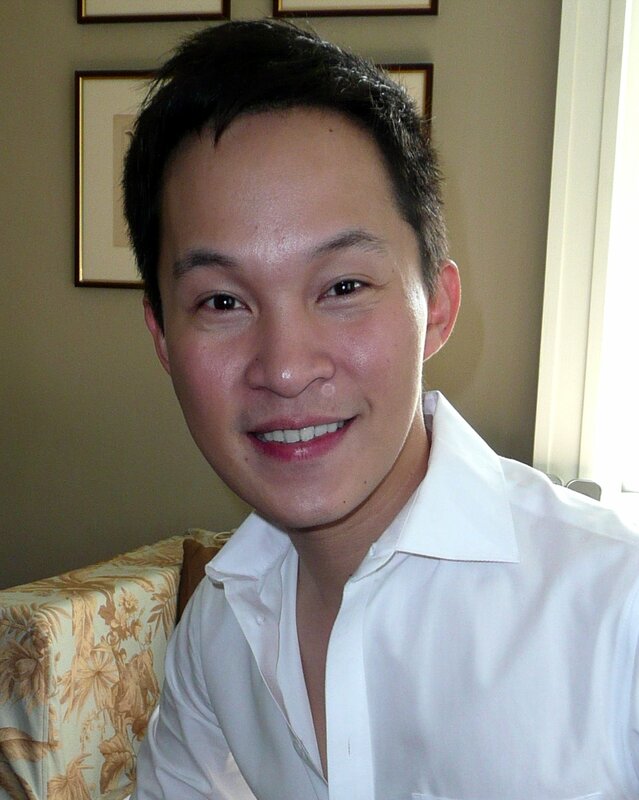 @kenpcho – What a kind compliment from you, thank you. @albertmoore – Thak you for your kind words Albert. Say hi to Gunther for me. @curry69curry – Thank you Curry. @PkStarburst – Thank you, I am not used to it yet, but it is a low maintainance hair style. Great photos of you two 🙂 Congrats Chris and Tawn! Be blessed and continue to bless others.